Some of the most precious memories I have of our years as an Air Force family, are the ones that involve the friends we made. Each person, each family we had the honor of being stationed with, hold a special place in our hearts. It was so much fun getting to know people on a personal level and sharing stories about their upbringing. We were often able to share those experiences when it was holiday time. We told stories of our favorite Christmas memories, from presents, to decorations, to the special foods our families cooked. This is where Potato Latkes first entered my life. We were stationed with a very special couple at Andrews AFB. Kenny and his wife Jodi were great at throwing parties and special get-togethers. If it wasn’t the weekly Sunday football gathering, it was the annual “Saturday After Halloween Party”. But, my absolute favorite and the one that will always be a special memory for me and my husband, and especially our children, was our invitation to Hanukkah and Passover meals. Having grown up in a Christian church, I never had the opportunity to share in these special traditions. That is why it was such an honor to be invited to these celebrations in our friend’s home. We especially loved it as Kenny and Jodi prepared the meals and then as Jodi would tell the history behind each traditional dish. Candles would be lit, prayers said, and a meal shared, that meant so much more to us than the food. It was about friends, from different backgrounds, coming together to share a tradition, that was given to us. 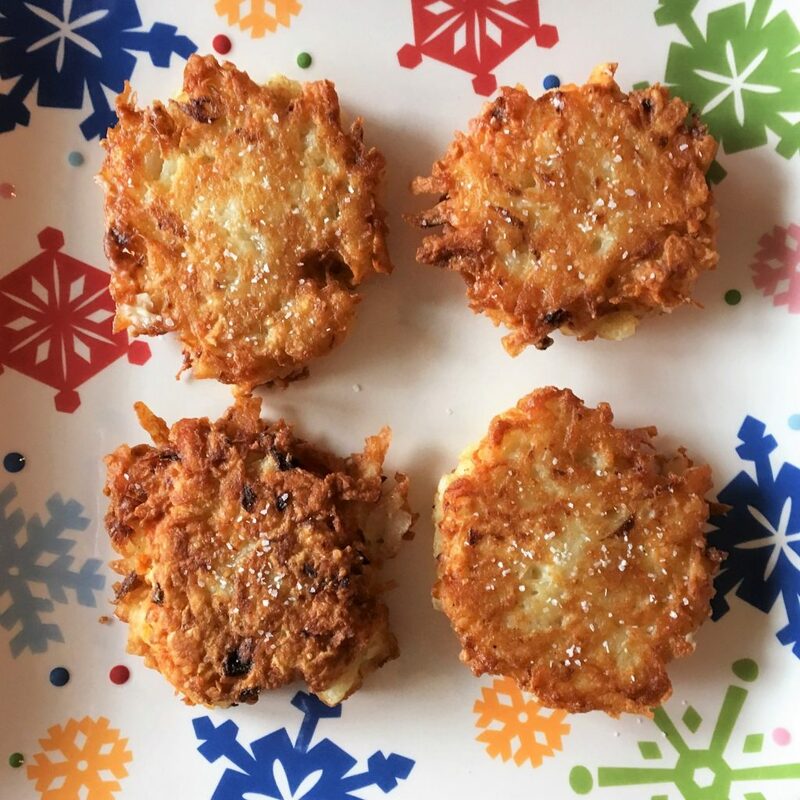 At the Hanukkah meal, Potato Latkes were always the center of the meal. Delicate potato and onion pancakes, lightly fried and served with sour cream and applesauce. Amazingly simple, but so delicious. Since then, I have only made Potato Latkes a few times. It was this holiday season, however that my friend’s daughter Soliel asked me to help her make them. 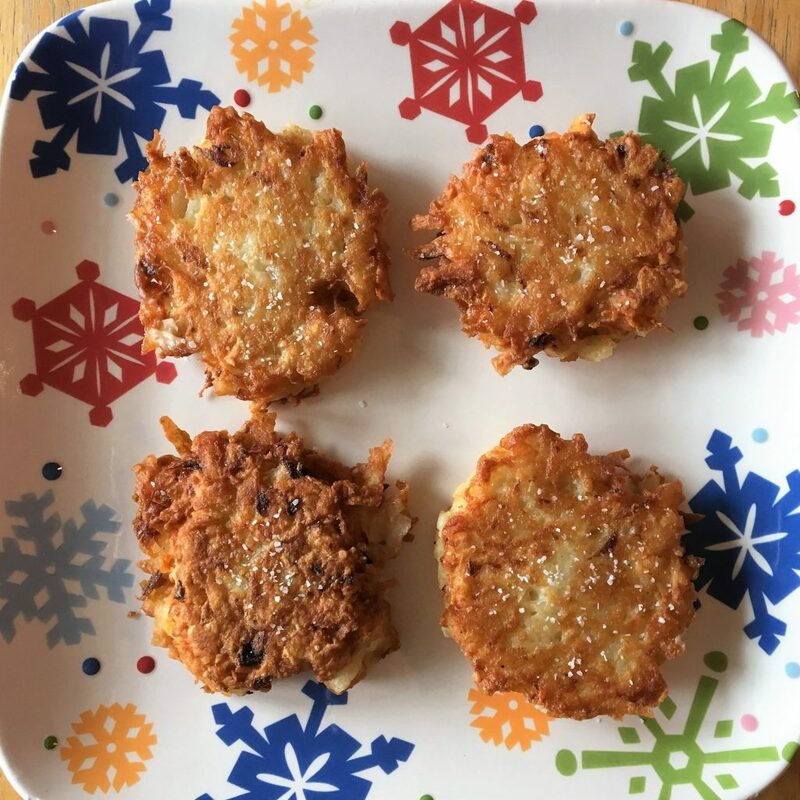 She was studying different holiday customs and had learned about latkes. It was very special to now share something I had been taught and pass it along to someone else, especially a child. So, thank you Jodi for always sharing your kitchen memories and Soliel for letting me pass them on to you. This holiday season, take the time to meet and learn from friends of different nationalities and backgrounds. Sit and listen as they tell the stories of memories made in their kitchens. Roll up your sleeves and learn how to make dishes from their homes, their countries, their traditions. It will warm your heart. It will create a bond and an appreciation for their lives. And as you make your own memories in your kitchen, make sure to share them with others. Happy Sharing and Giving this holiday season from the Memorable Kitchen! Using a food processor with a coarse grating disc, or with a box grater, grate the potatoes and onion. Transfer the mixture to a clean dishtowel and squeeze and wring out as much of the liquid as possible. In a medium heavy-bottomed pan over medium-high heat, pour in about ¼ inch of the oil. Once the oil is hot (a drop of batter placed in the pan should sizzle), use a heaping tablespoon to drop the batter into the hot pan, cooking in batches. Use a spatula to flatten and shape the drops into discs. When the edges of the latkes are brown and crispy, about 5 minutes, flip. Cook until the second side is deeply browned, about another 5 minutes. Transfer the latkes to a paper towel-lined plate to drain and sprinkle with salt while still warm. Repeat with the remaining batter. Note: Great Tip--Put grated potatoes in a salad spinner to get the excess water out.